Just when I should be pumping myself up for the big week ahead of us, I realize that I'm going to miss this place. Yesterday morning, Lyn came to my house at 5am so we could run 15 miles (6 with our friend Rachelle) before Eddie had to be at work at 8am. So we ran, and unlike last week, when the sun was blazing and the humidity was a killer, it was dusky and cool and just a great run. I liked it so much, in fact, that I went out for six more miles after dinner. Once again, low-humidity, not too much sun, and just a perfect run. Of course these low-humidity days don't happen often here in Houston, but when they do, I really like the place. We've spent enough time at the Houston Zoo that I know the circuit we always take (aquarium, sea lions, red panda, natural encounters, meerkats...) like the back of my hand. Yes, it's always too hot, and yeah, I'm always eager to get back in the car at the end of the day, but my boys love the zoo like no other place in the city. And I have a secret crush on the guy who runs the carousel. Isaac will also miss the "Ghost Trees" in Hermann Park-- Big live oaks draped with Spanish Moss that always reminded me that we were living in the Deep South (if the sweat after a morning at the zoo hadn't clued me in already). When it's too hot to go to the zoo, our next favorite spot is the Houston Museum of Natural Science (aka the Dinosaur Museum). Although I won't miss Annie's tears every time she fails to attract a butterfly to her outstretched finger, or Isaac's insistence that we visit the gift shop or navigating the drinks and condiments at McDonalds with four kids and a stroller, I will miss cool Saturday mornings, the ghosts in the gem vault, the awesome special exhibits, and the Geovator (I felt cool when they talked about frack jobs on NPR this morning-- I knew what they were talking about thanks to the Geovator!). We haven't spent much time there since Ike hit, but the beach is another thing we loved about living in Texas. We'd hop in the car, and in just about an hour, we'd pull our car onto the sand at Surfside and spend a few hours building sandcastles and bodysurfing. On the way home, we'd stop by one of our other favorite places, the small aquarium. On a related note, during two of the three Christmas breaks we spent in Texas, we went to the beach during the holidays. Can't beat that. And while I hated sweating all summer, (oops, I promised I wouldn't talk about things I hated about living here) I really loved running outside all winter, and picknicking in February. There's something satisfying about eating alfresco when you know all of your northern relatives are buried under a couple of feet of snow. One of the best parts of the extended summers is the floral profusion from February until December. I loved putting up my Christmas tree when flowers bloomed on the bushes outside. It felt kind of surreal. It's always fun to watch kids the first time it snows each season, but after spending three years in Minnesota, snow felt like old hat to the adults in the family, more likely to be met with a groan than a giggle. But here, the one time it snowed, even the adults went crazy. It was fun to watch adults capturing a child's sense of wonder. We've eaten well during our years in Houston. We've heard it said that Houston has more restaurants per capita than any other city in the nation. I'm not sure if it's true or not, but here are some places we'll miss: Paciugo, Jake's Grill, Ruggles, The Chocolate Bar, Azuma, Churrascos, Amazon Grill, Goode Company Seafood, Pappasito's and the Garden of Indian Delights (Yatra, London Sizzler, Moksha, Bombay Brasserie and Indika, to name a few). Even more than I'll miss the restaurants, I'll miss the grocery stores. I've seen the grocery stores around my new house, and, well, they look pretty basic compared with HEB and (the ultimate gourmet experience) Central Market. Just thinking about Central Market (the produce! the cooking classes! the chocolate!) gets me a little bit misty. Whenever we tell people where we're moving in Salt Lake, they always talk about what a great location it is. It's close to the freeways, close to Millcreek Canyon, close to my friend Blue. Here in Pearland, we've got the not-so-chic outside the beltway address, but I do live less than five minutes from all the shopping I need. And if I'm willing to drive a little way, I have some of the best shopping in the country close at hand at River Oaks, the Galleria, Rice Village and Highland Village. I'm going to miss my Crate and Barrel and Design Within Reach. While I'm eager to hit the mountain trails and learn to run at high altitudes, the running in Houston wasn't half bad. I'll miss the Surfside Marathon, the Great Pumpkin Fun Run, jogging in Memorial Park, and my weekly Saturday mornings in Silverlake and Southdown (which I've run so many times by now that I really run them in my sleep). My parting words of advice? Silverlake really needs a portapotty. When I couldn't hit the roads, I hit the gym instead. For the last two years, I've looked forward to my workouts at the YMCA, where I knew my kids were always safe, and I knew Carlos would never fail to whoop my booty into shape in spinning class. Yeah, I'm going to miss Carlos. Finally, and most importantly, we're going to miss our friends. My kids have made so many friends, and had such great teachers and administrators at Challenger. The staff at Texas Children's Hospital and their outpatient services took great care of us after Isaac got sick. My Wednesday lunch group and book group always engaged my mind. Our ward provided lots of interesting fodder for conversation, and, of course, friends that will last us far after we leave Houston. Don't worry, we'll be back. Even though we might not realize it yet, I've heard you can never get the Texan out of you once you've lived here. We've entered the single digits in number of days until our move. A week from today, the packers will be here, boxing up all of our stuff. Last week, I was running around like a crazy woman, making goodwill piles, finalizing things for the closing on both houses and the car we're buying. But all of that is done now, and it feels too early to start in on the final preparations-- things like packing suitcases and dumping the contents of my refrigerator and pantry. So today, and the next few days, are a period of relative calm-- we're pretty much caught up. But the calm doesn't feel especially enjoyable because I know what's coming next-- the crazy packing, loading, flying, closing, shopping, unloading, unpacking phase that will make me feel like I got run over by the moving truck. The good news is that two weeks from now the kids and I (and all our stuff) should be in the new house. In Losing Mum and Pup Christopher Buckley writes about the year when both of his parents died: first his mother Patricia to complications from surgery, then his father, conservative icon William F. Buckley, after a long illness. As an only child in a famous family, Buckley did his grieving in a more public sphere, and with more famous friends than most of his readers will experience. At times the book felt like a "how the other half die" sort of book, with descriptions of friends and parties and getting sympathy calls from the President of the United States. On the other hand, even though Buckley did his grieving around famous people and with lots of style, his story showed that no matter how famous or wealthy or connected your parents are, it's hard to lose them, and healing to hold on to funny and poignant experiences you had together (even if they didn't seem especially funny at the time). I got this book at the library on Friday morning, and by Friday at dinnertime, I was done reading it (it's more than 300 pages). Usually, I reserve that kind of uninterrupted reading for things like Sophie Kinsella's Shopaholic series or the Harry Potter books; books, in other words, where action takes precedence over style and character development. I still can't figure out of Love and Other Impossible Pursuits is chick-lit or not. On the one hand, it's sort of a chick-lit subject: a woman needs to learn to love her stepson while dealing with the death of her newborn daughter. And it read like an US Weekly. On the other hand, it's obvious that, as a writer, Waldman knows her stuff-- the book reads like someone with an MFA wrote it-- someone who knows how to tell a story, who's well-versed in telling just enough that the reader wants to know more. The backstory on Baby Isabel's death felt, well, artful. And for the most part, the characters were interesting and well-drawn. I wanted to have sympathy for Emilia, who had, after all, just lost a baby, but she kept doing such ridiculously mean things, especially to her mother. I wanted to be understanding with her husband Jack, who was also grieving, but who reserved judgment for everyone except Emilia, even when she was trying her best. All in all, it's an interesting read, especially the step-parent/step-child angle, but I can't decide if it was a "good" read or not. 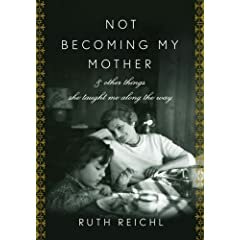 Miriam Reichl figures prominently in her daughter Ruth's food memoirs (Tender at the Bone, Comfort Me with Apples and Garlic and Sapphires), all of which are fantastic reads, so I was excited to pick up Reichl's newest book, Not Becoming My Mother. When I got it at the library last week, I was surprised at how small and light it was-- barely 100 small pages, and in truth, there's not much to it. It's a story we've heard before (or lived before): smart girl who wants to be a doctor and bows to cultural pressures first in choice of occupation, then in choice of spouse, and ends up frustrated, unhappy, and resolved not to allow her daughter to make the same mistakes she did. Reading it right after The Believers was an interesting experience, since both Reichl and Audrey Litvinoff were New York Jews of a certain age who faced similar life choices with similar unhappy results. Where are the stories of women who chose family over career and ended up happy? Do those stories even exist? You might think that a book filled almost entirely with unlikeable characters would be, well, unlikeable. Even though I would not enjoy having dinner with the Litvinoff family, I did enjoy getting to know them (at a distance) through the book. Joel, a self-important New York civil rights lawyer, suffers a major stroke in the opening chapters of the novel, and his family struggles through a year where he's gone, but not dead. His kids are timid (Karla), self-righteous (Rosa) and addicted (Lenny) and his wife Audrey's world view and inability to hold her tongue gets her in trouble with everyone. Heller's book is described as satire, which I guess means that we're supposed to see the Litvinoff's as larger (or ruder) than life versions of real human beings. But the contrast between young Audrey meeting Joel for the first time, and Audrey forty years later both shocked and depressed me. Can giving your life to raising a family and supporting a (good?) man's needs and causes turn a woman into an unhappy, directionless beast who finds joy in keeping her kids co-dependent (Lenny) and in speaking her mind, whatever the cause? 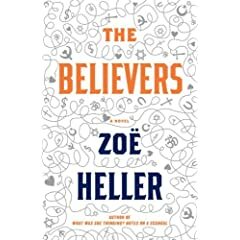 If nothing else, The Believers feels like a cautionary tale for stay-at-home wives and moms to diversify and not make spouse and kids the sole focus of one's life. I've been a little bit nervous about saying anything about it on the blog, but it looks like (fingers crossed!!!) we found a buyer for our house here in Texas. We actually got the offer the day I flew home from Boston, but in the hubbub returning from the marathon, I didn't say much about it. But yeah, it's a huge relief to have the house on its way to being sold to someone who doesn't mind walking up a flight of stairs to go to bed. We've entered the final countdown. Two weeks from today, the movers are coming to start packing things up. Two days later, we're getting on a plane headed two Utah, where we're signing our life away to a big mortgage and a big car (both good things, but a little scary). Two weeks after that, Eddie will sign the papers on this house, graduate from his interventional cardiology fellowship, hop in the van and drive for two days. At the same time I will hop in a van and run in the Wasatch Back relay for two days. At the end, if everything goes according to plan, we'll have only one house, in Utah, and a week or so to relax before the new job starts. Until then, I think I'm going to be very busy. I spent hours yesterday emailing and calling magazine companies to have our subscriptions transferred to the new house. Today I spent all morning calling utility companies in Texas to have our services stopped. This afternoon's project? Sorting out mortgage stuff with the title company. This is the second house we've sold, and I don't remember that there were quite as many details I had to keep track of last time around. Sometimes moving feels like a full time job, but it's a happy job, because pretty soon we'll be on our way to our new house (another exciting full time job) and new adventures. In the meantime, if you call our house and get a busy signal, rest assured that I'm sitting on hold with the phone company or something equally uninteresting. I recently interviewed Margaret Young and I've been in the process of writing a review of Young and Gray's new documentary Nobody Knows: The Untold Story of Black Mormons for the winter issue of Segullah. I'd read the first of the Standing on Promises books a few years ago and loved it, so I decided to get my hands on the second and third volumes of the trilogy while on a black Mormons kick. This installment of the story covers the late 1840s to the early 1890s and follows the story of the James, Flake, Abel, Gray and assorted other families. Like the first book, it was interesting and well-written. The footnotes for each chapter were fascinating. My only criticism is that perhaps it stuck a little bit too closely to the history and didn't have enough fiction. 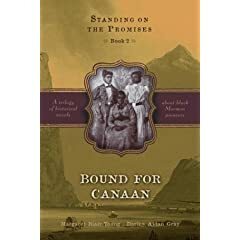 I felt like I was getting short vignettes from important events in the history of black Mormons, but not a lot of everyday events or character-building scenes to glue the events together. Overall, it's definitely worth reading and illuminates the unique situation of those who came to Utah either as the slaves of Mormon converts or as Mormon converts themselves. 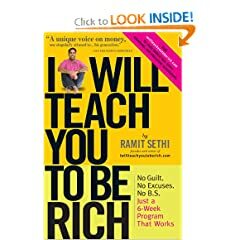 I'll admit that I haven't read every single word of Ramit Sethi's I Will Teach You to be Rich (yet) but I think it's already saved us thousands of dollars. It's the perfect book for twentysomethings who want a head start of their peers in being smart with money (or even for thirtysomethings like us who have been in school forever and putting off adult sorts of things like investing and saving). Sethi takes readers through the steps of getting out of debt, finding the right credit cards and bank accounts (complete with recommendations), and getting started accumulating wealth. His most important recommendation? Start early! If you want Sethi's ideas without shelling out the cash for his book, read his blog instead. It's even a pretty fun read-- a rarity (I'd imagine) in the world of personal finance books. On a December night, after spending the day by their daughter's bedside in the ICU, Joan Didion and her husband John Dunne return home and go through the ritual of making and sitting down to dinner. Suddenly, Dunne collapses, and within minutes, he's dead. In The Year of Magical Thinking, Didion takes readers through the next, the hardest year of her life; the year in which she finds it hard to accept the ways her life has changed. The Year of Magical Thinking is a very personal book, and although I've never lost a spouse or parent or someone close to me, I could definitely identify with the feelings she has as she watches her adult daughter, Quintana, suffer first from an illness and then from related injuries. It feels sort of ruthless to criticize a book like The Year of Magical Thinking, especially since Didion's honesty in the face of her experiences is pretty naked, but the main thing that got in my way of really loving the book was that her world view, with wealthy and influential friends, fancy restaurants and expensive hotels, seemed outside my reality and felt a braggy, but that shouldn't and doesn't deter from the fact that Didion writes as therapy and as a testament of her love and as a way to help others who have to face similar shocks in their personal life and does it well. What if Berlin were destroyed by an atomic bomb at the end of WWII? What if the establishment of Israel failed? What if the world's Jews congregated in Sitka, Alaska, where the American government gave them a place to live for fifty years? What would happen when those fifty years were up? 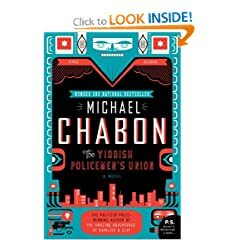 This is the world the characters in Michael Chabon's novel The Yiddish Policemen's Union inhabit. Meyer Landsman, a detective with the homicide unit in Sitka, is ostensibly trying to solve a few murders before turning the department over to US control, but he's really trying to redeem himself before it's too late. The book reminds me of classic film noir-- Sunset Boulevard or something like that, with a little bit of The Wire thrown in, all set to the tune of the Hava Nagila. I picked this book up expecting not to like it much, so I was in for a surprise when I devoured it in two days of plane flights before and after the Boston Marathon. I read it at the same time I was reading the early chapters of Francine Prose's Reading Like a Writer and I found myself literally forcing myself to read more slowly and devour Chabon's words. And what words they were. Chabon tells the story of Josef Kavalier and Sam Clay, cousins who meet in Brooklyn after Kavalier escapes from Prague before the start of WWII. Sam wants out of his dead-end job, and with his ideas and Joe's art skills, the two create comic book heroes that catapult them into the high life. Since the book evokes pop art images and colors, it shouldn't come as a surprise that the writing is over-the-top and splashy too. Chabon does it well, without turning his characters intothe two-dimensional figures that Kavalier and Clay specialize in. I'm always curious about authors' lives-- whether they're stable (and boring?) like mine, or turbulent (and exciting?). Based on the Ondaatje novels I've read, The English Patient, Anil's Ghost, Divisadero, and In the Skin of a Lion, I wouldn't have expected Ondaatje to grow up in a cookie-cutter suburb eating tv dinners and watching Donna Reed. And he didn't. Instead he spent the first twelve years of his life with family in Sri Lanka, where his parents both came from the Indo-European gentry. 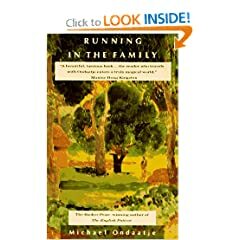 Ondaatje's love for both his homeland and his family (crazy as they may be) oozes from Running in the Family. He tells colorful family stories, writes about his father's struggles with alcoholism, and about the antics of various extended family members. I've never read Ondaatje's poetry, but this book informs his fiction and introduced me to his poems. When I added this book to my must-read list, I thought it seemed pretty straightforward-- a girl who grew up in a haunted house talks about how it affected her. And yeah, I guess that's what the book is about, except that the girl was a guy when she was growing up. We went out to dinner with friends while I was immersed in Growing Up Haunted and they asked what I was reading. When I told them it was about a transsexual who grew up in a haunted house they actually laughed at me. And then I realized how preposterous it sounded and started to laugh along. 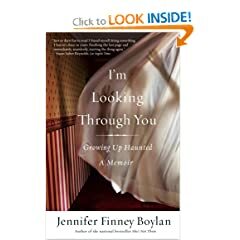 But the story, and the extended metaphor, both work-- growing up, Finney Boylan was haunted not only by the specters in the dilapidated mansion, but also by her confusion over who she was and who she wanted to be. Smartmama recommended that I read this book and I loved it! There are so many good ideas for decorating, especially decorating small spaces with small budgets. In fact, since I'm not someone who lives with a family of three in 380 square feet and is trying to make a single room serve eight purposes, my only criticism of the book is that it doesn't apply as well to people living in, well, actual houses. 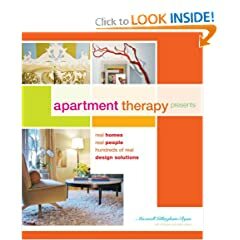 I guess that's what you get when you buy a book called Apartment Therapy, though. Regardless of the appropriateness of the spaces features in the book, I loved that each space featured the exact colors of paint and the places to purchase many of the furnishings in the spaces (at least half of which came from Ikea-- in fact, I think only one or two spaces in the entire book were Ikea-free zones). I'd recommend it to anyone who needs to decorate a space, even if that space isn't small. Lots of great ideas and stylish spaces! Three weeks from today, the moving fairies will descend upon the house we've lived in for the last four years. Although I have no personal experience with the moving fairies, I've heard other lucky people say that movers possess a certain kind of magic that enables them to swoop into a house, box it all up, and pack it into a truck-- all in the span of a single day! All of our previous moves have involved weeks of boxing, a couple of sweaty days inexpertly loading and unloading a truck, and much marital strife. The moving fairies (even if they arrive in the form of burly, sweaty, large men) sound pretty darn amazing. So even though I could kick back and wait for the moving fairies to show up to do the heavy lifting, some primitive urge has struck. Call it mania, call it nesting without pregnancy, call it whatever you want, but I'm so dang excited to load up the stagecoach and head west (except, even better, we get to fly instead of caravaning across the country), I can't resist getting things ready. So I'm purging. Yeah, we're moving into a new house that's 1600 square feet bigger than the one we're in right now, but I'm getting rid of things left and right. If you show up at my house unannounced, you might end up getting hit with a flying easel or something else getting tossed on top of the giveaway/throwaway/recycle pile, which now takes up three-quarters of our garage. I figure, if we're not using it here, we won't be using it once we get to Utah, so we might as well leave it behind. I may be nice about most things, but I'm a ruthless purger. Tonight, after the kids go to sleep, I plan to sneak into the playroom with a few large black bags and toss out all toys that I haven't noticed them playing with in the last few weeks. Fortunately, we've found good homes for most of our big items, like bookshelves and dressers. Unfortunately, that means we've had a lot of books sitting around. Yesterday I went to the moving company and picked up 18 book boxes, which is about half as many as we need to get all of our books boxed up (should I be embarrassed that my cookbooks alone took up three boxes?). So I guess I get to satisfy a little bit of the packing urge as well. Someone better restrain me, or the moving fairies aren't going to have much to do when they arrive in 21 days.